SAC winning the Homecoming 2018 Parade float contest. From left to right: Julia Gramont (graduate advisor), Alissa Kinast (philanthropy chair), Anna Schlotterback (social and Siblings Weekend chair), Jenna Meyers (Homecoming co-chair), Erin Jessup (secretary), Megan Cain (co-president), Valerie Brown (co-president), Alyssa Cattaneo, Andrew Sterr, Richard Greenfield, Alex Smith, Laura Ledin (general council representative and Homecoming co-chair), Lauren May, Sam Matrisciano (alumni engagement officer), Larissa Sheehan, Kat Mraz, Allison Leczycki (business liaison and co-chair), and Cindy Yu. 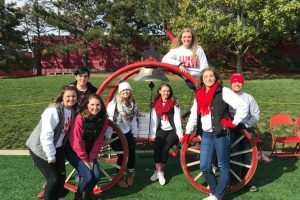 Student Alumni Council (SAC) started of the fall semester with many successful Homecoming events. Take a look at the recap below and be sure to join the group at Homecoming 2019: Come One. Come All. with major events happening Saturday, October 26. Homecoming week started off with the Bloomington-Normal community window painting. SAC students, as well as some other student volunteers, painted the windows of community locations to initiate a week of Redbird pride. On the Tuesday night of Homecoming week, SAC members competed in the annual Redbird Rumble. Alyssa Cattaneo, Alex Smith, Erin Jessup (secretary), Laura Ledin (general council representative and Homecoming co-chair), Megan Cain (co-president), Valerie Brown (co-president), Allison Leczycki (business liaison, traditions chair), and Andrew Sterr. Throughout the week, SAC members prepare a Homecoming Parade float, to be entered in the float building contest. This year’s theme, of which the SAC students based their float idea, was “Redbirds Rising.” The students created a cloudy sky, out of which flew Pilot Reggie in his glorious jet plane. SAC received first place in the float building contest, retaining its title from the previous year! After the parade, everyone gets ready for the big game where SAC students had the honor of ringing the victory bell every time the Redbirds scored a touchdown.